As I jotted down answers to these questions, I had to take a moment to look around the room and remind myself where I was. No, I was not sitting in a therapist’s office. No, I wasn’t reading from a self-help book. Rather, I was in a ballroom at Château Élan, accompanied by 100(ish) Evening MBA students at the inaugural Goizueta Evening MBA Leadership Retreat. Not an environment one would typically associate with such deep self-reflection. 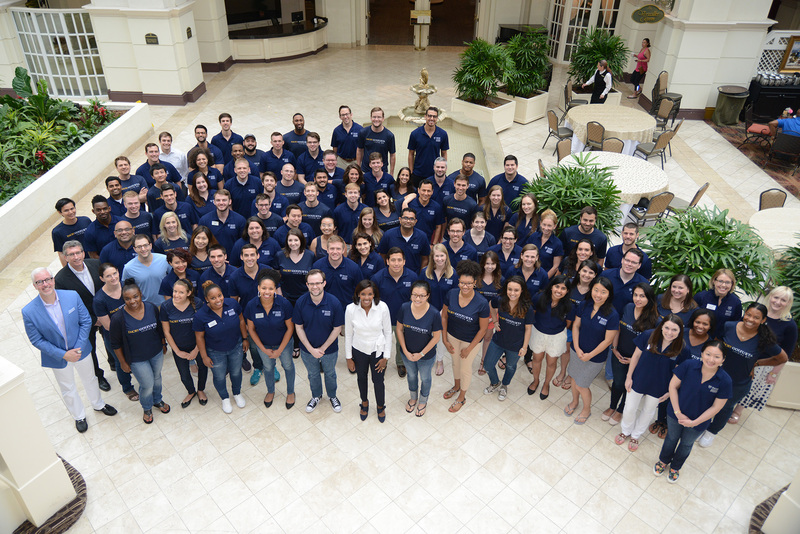 While Goizueta’s leadership course has been a core component of the EvMBA curriculum for several years, this year marked the pilot of the retreat format. I wasn’t sure what to expect from the retreat. I suppose I anticipated a few trust falls, some cliché parables about leadership failures, and a lot of small talk with fellow students. 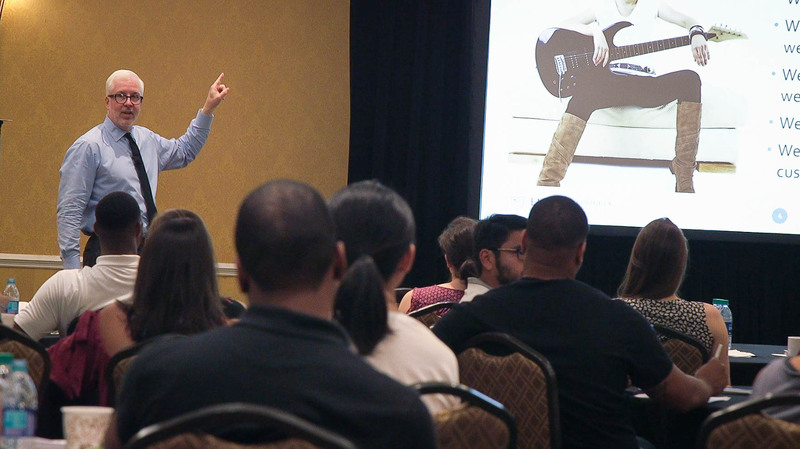 But during the first educational session when Brandon Smith posed the aforementioned questions, I sensed the room shift, as if we collectively realized that this was not your average leadership retreat. Brandon Smith, “The Workplace Therapist,” inspired us with a sense of purpose for the weekend. He assured us that each of us have the capacity to become high performing leaders and each of us has the potential to become a “The” – “The Digital Marketing Guru,” “The Inventor of Bitcoin 2.0.” However, he warned us, we must be intentional in deciding what kind of “The” we will be. Throughout the weekend, Smith, along with co-facilitator Dean Erika James, equipped us with some essential tools to guide us in our efforts to become high-performing leaders. 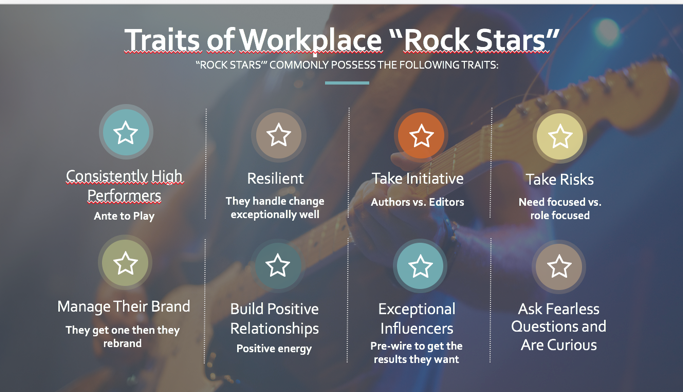 Smith identified the traits of workplace rock stars (see image below). Dean James led us through a case study that modeled imperfect leadership in action. Both facilitators challenged us to take inventory of our current strengths and weaknesses. Throughout the sessions, I made an action plan – a long to-do list of how I intended to apply the leadership lessons from the weekend to my professional and academic contexts. I had great ambitions for the future. But looking back, I’ve come to realize that the retreat itself was actually the launching pad for my action plan. My peers and I began implementing our action plans even before we returned home. How so? During a typical week of work and evening classes, it’s easy to fall into a slump of negativity and solitude. We get stressed about office deadlines, homework deadlines, midterms and grades. We suffer through assignments on our own. But during our weekend retreat, my classmates and I had the time to just enjoy each other’s company. Over meals and glasses of wine, we savored extended conversations – much less rushed than the small talk that we squeeze in before and after class. Between sessions, we took strolls through the vineyard – a journey much more scenic than our biweekly walks to and from the Fisburne parking deck. During our social events, we cooked and danced and gambled – we discovered our classmates’ hidden talents (or lack thereof). The weekend away offered space for us to wipe away our workaholic facades and give room for vulnerabilities to appear and trust to develop. At school, each of us have developed a brand. Some of us sit on the front row and have a prepared answer for every question the professor posits. Some of us always show up to class with refreshments. Some of us rarely show up to class. While every day presents an opportunity to rebrand, it can be difficult to break free of patterns. The leadership retreat provided a safe space for rebranding. A few of us made small changes – we were more social or outgoing than usual. Some others made big splashes – like the student who jumped in the pool fully clothed. And still others just stuck to their established brand. Whatever changes we made or didn’t make, the point is that we had the freedom to explore. Very few contexts offer that kind of nonjudgmental social network. As working professionals, each of us has some sense of professional purpose that we’ve been working towards. Throughout the EvMBA program, we may have slightly altered that purpose; however, we rarely take the time to deeply reflect on the changes we are making. We were lucky to learn from two individuals with very clear senses of purpose – Brandon Smith, whose goal is “to end all workplace dysfunction,” and Dean Erika James, who seeks opportunities for innovation and change in the midst of crises. These two leaders challenged us to grapple with difficult questions, like “what do you want written on your tombstone?” During poolside breakout sessions and late-night conversations at the bar, we then wrestled with those questions and helped each other work through workplace dilemmas. The inaugural Goizueta Evening MBA Leadership Retreat offered more than just lectures, fancy meals and opportunities to socialize. The weekend escape provided time and space for all of us to figure out what kind of leaders we want to become, and then granted us the freedom to begin that leadership transformation. I’m grateful for the disruption in our routines, and I hope that this annual event proves meaningful to future cohorts.